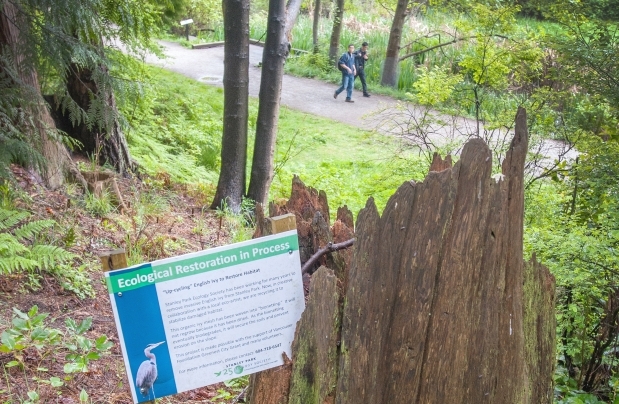 Sign reads ‘ecological restoration in progress’ near Lost Lagoon in Stanley Park. Invasive, non-native plants flourished in wake of the big blowdown. The 500 volunteers in the Stanley Park Ecology Society (SPES) have been diligently working with Vancouver park board staff to uproot the invaders and replace them with native plants. But it costs money. And Monday, they got some from the Stanley Park Brewing company, which donated $20,000 to SPES. The donation comes from a pale ale called Windstorm, named after the natural disaster in 2006. “We introduced this new beer as a limited edition offering where partial proceeds from every sale are being donated directly back to the Stanley Park Ecology Society,” said Jim Lister of the Stanley Park Brewing company at a press conference in the park Monday. “We definitely have an ongoing need to remove invasive, non-native plants from Stanley Park,” said Thomson. “English Ivy, Himalayan blackberry, yellow flag iris — there’s upwards of 60 different species of invasive plants in the park. Community volunteers help us manually remove those species. “Many of these species have been here in the park for decades. They were introduced because they are lovely to look at, and people didn’t understand at the time how aggressively they would grow. “We need to do some restoration work (after) the removal of larger patches of invasives. We (do) restoration work with native plants, (which we grow) in our own simple little nursery in the heart of the park, in the service yard. “Good ones to replace the bad ones are salal, salmonberry and red osier dogwood. “In areas where we’re removing invasive plants, it leaves the soil exposed to erosion from the rains. We are having to plant replacement plants there. “This is an exciting story, where we’re actually using some of the biowaste of the removed invasive plants, like English ivy (for slope stabilization). “We have been working with an environmental artist, Sharon Kallis, on a technique where we can weave this removed ivy into large matts, like big quilts, if you will. “The forest has been cut innumerable ways by roads and trails and, in this case, by unsanctioned trails, where people have been off the official trails, either by bike or foot. “It impacts the forest floor by compacting it and pressing back the plants. It makes it difficult for wildlife, small wildlife, to safely cross these areas. “We need to educate (people) on the hazards of invasive plants, not only in Stanley Park but throughout the whole Lower Mainland region. “How do we effectively remove them, in an ecologically safe manner, and make that safe for humans, too? There are some invasive plants that are really quite toxic for people to handle.